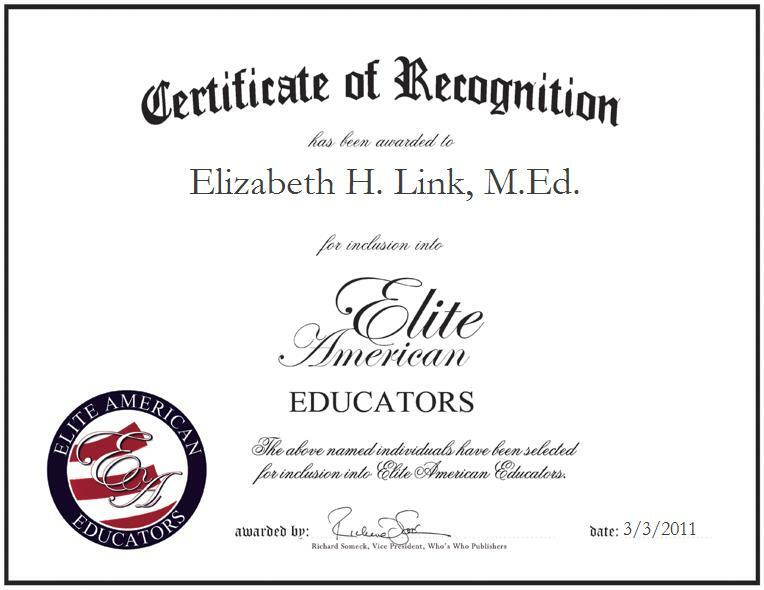 Oakton, VA, March 3, 2011, Elizabeth Link, educational consultant, has been recognized by Elite American Educators for dedication, achievements and leadership in student advocacy. Drawing on 29 years of professional experience, Ms. Link is dedicated to her belief that having a child at a young age is not a permenant determent to a woman. Tirelessly, she collaborates with schools, community organizations and policymakers to ensure that opportunities are present for pregnant and parenting students. She was recognized for her efforts by the National Youth Employment Coalition in 1999 and 2003 with the PEPNet Award for project opportunity programming. In 1963, Ms. Link earned a Bachelor of Science in business education from Concord University. Following this, she graduated from the University of Virigna with a Master of Education. She holds professional affiliations with the Virginia Education Association, the National Education Association and the Martin Luther King Cultural Board. Additionally, she serves on the board of directors for Jobs for Virginia Graduates and Generation Hope.